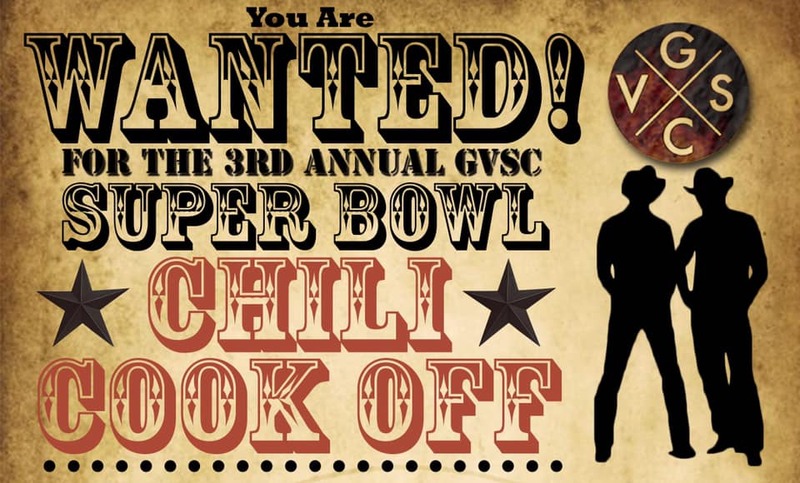 Who’s ready to put the CHILL in CHILI Get ready for another cook-off showdown as we bring back the Original GVSC Annual Event with all new Super Bowl teams and Halftime Show, all-new football-style games, and of course... new chili to taste! We kick off with an Open “Mule” Bar in The Saloon from 4:00-5:00pm followed by our Annual Super Bowl Chili Cook-Off from 5:00-630pm out back in the Mess Hall. Your meal will include the chili-tasting from all of the competitors alongside a family-style meal of mini pulled pork sandwiches, hot mac ‘n’ cheese, fresh cole slaw, and corn bread. Afterwards, enjoy s’mores over the campfire pit, the Super Bowl LIII 2019 Game from Atlanta, Georgia projected live on the big screen and the ever-popular Half Time Show starring Maroon 5! All-American Western outfits and Cowboy Attire are strongly encouraged so saddle up and experience one of GVSCs most exciting traditions... Yee Haw! If you want to compete in this year’s cook-off for Miami’s best tasting chili, email us at GayVistaSocialClub@gmail.com to enter. Only 15 Contestants will be allowed to enter. All chili chefs will receive FREE admission with Promo Code and of course... bragging rights! Tickets are $15 in advance, $20 day of, FREE for all GVSC Supporting Members. Ticket includes admission, chili tasting & family-style dinner, open “Mule” bar, and the Super Bowl Game and Half Time Show. All proceeds raised go to benefit GVSC Project Pride, our fundraising effort to send us to Miami Beach Pride!